Mignon is a member of the firm's corporate litigation practice group, handling a wide variety of issues for her clients such as business disputes, consumer protection, real property disputes, non-compete agreement enforcement, and securities fraud. Her work with the Corporate Finance and Real Estate Practice Groups allows her to negotiate, structure and document commercial and real estate deals both in Alabama and North Carolina. 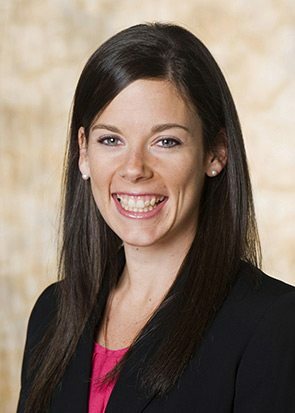 Mignon is an associate in the firm’s corporate litigation practice group, where she defends clients such as community, regional and national banks; business owners; and insurance companies involved in business disputes, consumer protection, real property disputes, non-compete agreement enforcement, and securities fraud. In particular, Mignon has experience representing financial institution clients in Financial Industry Regulatory Authority (“FINRA”) arbitration proceedings involving a wide range of issues, including investment suitability, churning claims, raiding claims, and the enforcement of non-compete and non-solicitation provisions. Mignon also practices with the real estate and corporate finance groups where she represents business owners and landowners in a variety of commercial and real estate deals. As a transactional attorney, Mignon has experience in negotiating, structuring and documenting real estate leases, loans, options and sales, and both asset and equity purchases. While at the University of North Carolina School of Law, Mignon served as the Articles and Notes Editor for the North Carolina Banking Institute Journal, was a Spring Honors Writing Scholar for the Research, Reasoning, Writing, and Advocacy Program and was on the Dean’s list throughout her legal study. She was also inducted into the University of North Carolina’s chapter of the Order of the Coif, a recognition extended to the law school’s top graduates for their outstanding academic achievements. Prior to law school, Mignon earned her B.A. in Dramatic Arts from the University of North Carolina and now puts her acting training to use for her clients, both at the negotiating table and in the courtroom. Born and raised in Birmingham, Alabama, Mignon is involved in a number of professional and civic organizations in the community and regularly gives back to the community including through her work for the Alabama Theatre and the Reed Foundation.